this page should be viewed with red and blue 3D glasses. 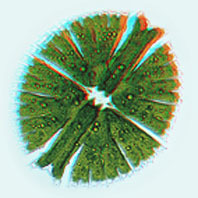 Desmids are microscopic algae that can only be found in freshwater environments. They have complex three dimensional shapes and are ornamented with spines and other protrusions. Micrasterias rotata is one of the largest desmids. It has a size of almost 0.4 millimeter. They are not easy to find since they require special water conditions. Many of the species of desmids live in the acid waters of marshes. Desmidium swartzii , a colony of triangular Desmids. The individuals are positioned towards each other with a slight twist which makes the overall shape of the colony like a spiral. The desmids (Desmidioideae) are one of the two classes belonging to the phyla Gamophyta, the conjugating green algae. The other class, the Euconjugatae (or true conjugating algae) contain some species that are well known to everyone although almost no one realizes this. 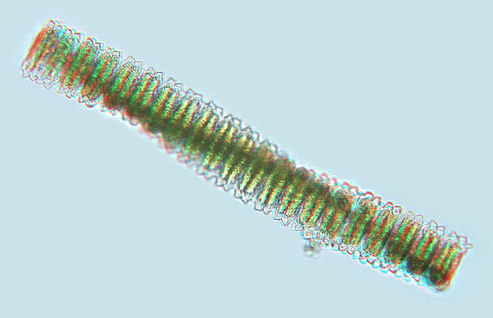 See Spirogyra in three dimensions. The background image shows a 3D version of one of my pen and ink drawings of several of the smaller types of desmids. 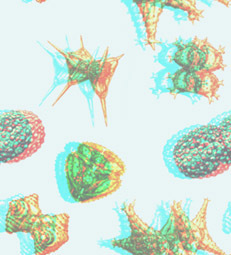 The species depicted belong to the genus Staurastrum (three processes), Staurodesmis (four processes) and Cosmarium (the round one with the knobs).